We have opportunities to attract investments in interesting and promising start-ups. We are ready to offer comprehensive support (intellectual, scientific, technological and technical, financial, marketing) within our Avenston Labs initiative to startups in field of renewable energy sources (RES) and related industries, including information technologies (IT) sector, especially if such projects are also related to energy of the future. Our priority directions are projects in the field of photovoltaics (solar energy, solar power-stations), and also solutions and technologies of BIPV (solar power-stations, built-in into houses or buildings), but we are ready to support promising and interesting startups in other RES-related areas, such as energy saving, accumulation and storage of electric power, smart grids and microgrids. Some directions, which we consider interesting for innovative development and investments, are described below. Wastes from growing and processing of different agrocultures (afterharvesting residues, straw, sunflower husk, glumes etc.). Energetic cultures (basket willow, switchgrass, miscanthus). The obtained data become a basis for development of effective innovative methods and technologies of collection and pre-treatment of biomass, its storage and conversion (transformation) into electric or thermal energy. BIPV (Building-integrated photovoltaics) stands for photo-electric modules, which not only serve for electricity generation, but are also integral part of household furniture. According to forecasts of specialists, exactly the segment of BIPV technologies will get most intensive development among other solar technologies in a medium-term perspective. 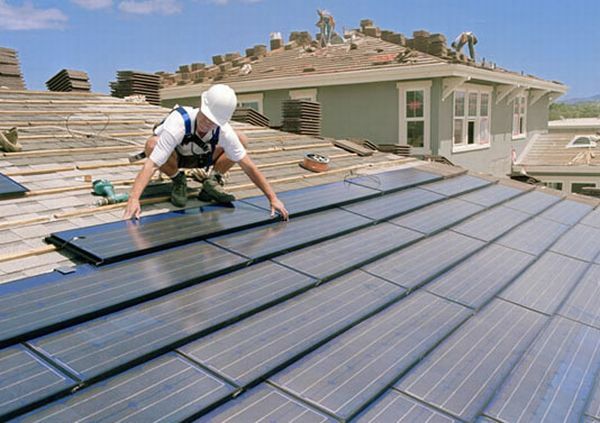 Active implementation of BIPV systems is related to their users’ aspiration to embed and use solar technologies in electrogeneration systems in large cities, where demand on electric power is large and stable, but high cost of land lot does not allow to install economically profitable terrain solar facilities. In addition, proprietors of private houses, which are dissatisfied by aesthetics of traditional solar panels, but still having intention to use modern solar technologies, could be also interested in installation of BIPV systems. Direct current batteries (accumulators), where accumulation of electric power takes place. Inverters, which transform direct current into alternating current with frequency, necessary for consumers. Control system, which is supervising all processes, optimizing energy accumulation and redistribution of the latter between consumers with the object of the most effective use. Providing of energy independence for an object; during periods of low (even zero) generation it works on accumulated energy, reducing bills on electricity consumed from external centralized networks. Management of generated electric power and its redistribution to provide consumer needs during peak-load periods. Providing of smooth supply of electric power from renewable energy sources, when insufficient power is compensated from accumulated energy sources, promoting reliability and stability of transfer and distribution of electric energy. Today’s situation at the market of accumulators, particularly speaking about lithium-ion batteries, reminds market situation on solar batteries few years ago, when the qualitative leap in technology of their production happened. So producers of lithium-ion batteries now offer us more and more capacity in their power solutions, and price/capacity ration goes down constantly. Fuel elements (fuel cells) work due to use of chemical energy of hydrogen, generating ecologically clean electric energy without harmful wastes. Decomposition of hydrogen results in electric power, water and some amount of heat. In addition, fuel elements have very high efficiency ratio from 60 to 80%. Fuel element is a product with unique functions and application possibilities, it can be used both for energy supply of a large enterprise and as battery pack for a small notebook. Fuel elements operates similar to traditional batteries, with that only difference, that fuel elements do not require recharge, they work until there is some hydrogen as fuel resource. Exactly hydrogen, its generation and storage are the greatest problem standing on the way of mass exploitation of fuel elements. Today main part of hydrogen is generated from natural gas, but it can not be considered absolutely chemically «clean», because of hydrogen sulphide and СО residues. For this reason hydrogen technology looks most perspective due use of solar panels, it must be optimized so that cost of hydrogen would be cost-effective and acceptable to consumers. Smart Grid are intellectual power systems, where all network equipment co-operates due to modern communication and information technologies. Information, accumulated into unified grid, is further analysing, and obtained data allow to optimize the use of electric power in the system, bringing down expenses and losses and promoting efficiency and reliability of the grid. Smart Grid is fully automated system, it can autonomously monitor and redistribute streams of electricity to provide its maximally effective use. Smart Grid technology is a possibility of dynamic management of electric systems and demand adjustment, which will allow to decrease expenses and to make substantial safety improvement. It will allow to get rid of nowadays system of «centralized energy supply», which is based on large-scale energy networks using high voltages. With such energy supply structure even a small local failure can cause mass disconnection of consumers. Operational synchronization of electric power generation sources, electricity storage and consumption nodes. Support of designed quality standards for transported electric power. Consumers have possibilities of active participation in network functioning, particularly by choosing electric power suppliers. High stability of the network to cybernetic interference (viral attacks, breakdowns etc.) and physical influence of malefactors. Self-recovery of energy supply system after failures in electric power supply. Microgrid (mini-power system, micro-network) are autonomous small «smart» electric networks that can connect few local producers (sources) of electric energy and their consumers. Due to the fact, that microgrids integrate different local energy-generating RES-based capacities (wind turbines, solar batteries, heat pumps etc. ), they can function fully autonomously, in «power island» mode. Commonly believed that microgrids are micro-networks with capacity less than 10 MW; this power capacity is enough to provide electric power for a residential block, an office center, some industrial enterprises, schools, hospitals and other objects of public importance. As an experiment, United States Department of Energy (DOE) planned to invest 55 million dollars as support for eight pilot microgrid projects. Similar researches are conducted in China, Japan and European countries. Specialists forecast, that effects from wide implementation of microgrid technologies will allow to save about 3 billions of dollars annually already in the nearest three years. Main advantage of microgrid technologies is a possibility to substantially decrease losses of energy. According to researches, too long lines of electricity transmission are the main reason of energy losses. Use of microgrid technologies that allow to shorten distance between a producer and a consumer of electric power without a necessity to transport electric power on large distances, will considerably decrease electricity losses. In addition, microgrids considerably increase reliability factor of energy supply. Microgrids are the basis to develop co-operation among owners of private solar power-stations and other proprietors of equipment, working on renewable energy soures (RES). Avenston Labs is open for any possibilities in above mentioned directions. We are interested in support of new technologies and projects. Cooperation with Avenston is a possibility to bring down considerably your capital investments, necessary for realization of a startup and acceleration of technologies or products promotion to market readiness.